Continuing to build its streaming media strategy, CNBC Digital just unveiled a production studio designed to develop and produce video content for finance-minded viewers. The overarching thrust of the programming is to “give our audience of decision makers, serious investors and affluent consumers an edge,” Kevin Krim, senior vice president, general manager of CNBC Digital, said Monday. As for the puppets, Krim said: “We also believe [the Workshop] will be a place for experimentation and fun that allows us to stretch perceptions of the world of business, as well as audience and advertiser expectations." Streaming media is already high-growth area for CNBC.com as the business hub experienced a 194% increased video views (to 9.3 million) over the last year. What’s more, average daily video viewers were up 317% (to 137,000) over the past year. Additional programming includes “Big Data Download” -- a twice-daily program that attempts to tap into the big data craze; and the just renewed interview show, “Off the Cuff” -- both of which are co-produced by and now appear on Yahoo Finance. 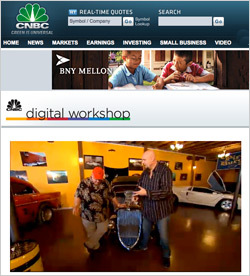 The CNBC Digital Workshop will operate as part of the CNBC Digital Editorial organization.